Insurance is an incredibly popular industry for startups these days. There’s a lot of discontent with the way this industry has been run, largely as a result of government policy. 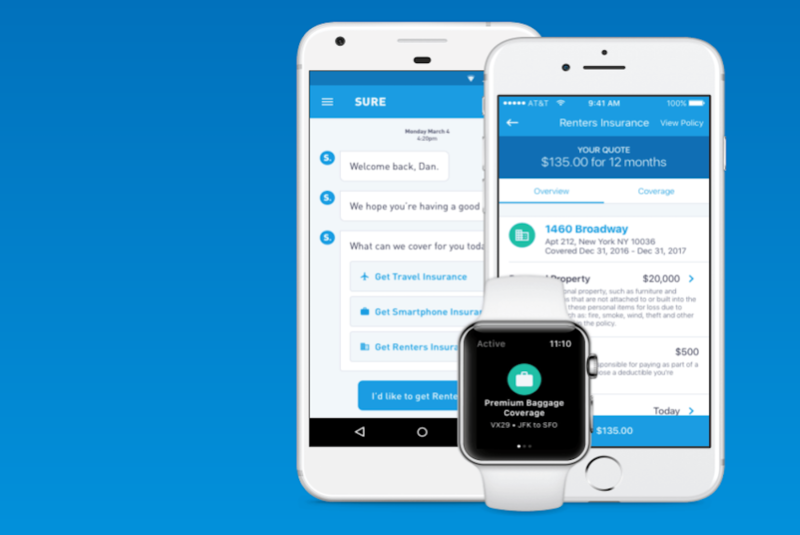 Dozens of successful startups have popped up over the last year aiming to offer new insurance options from smart devices to health insurance. Now, a 2014 startup called Sure is expanding its platform, having just finished a round of funding led by IA Capital with $8 million—a very impressive sum for such a young company. They’ve gained the financial support of many big-ticket organizations including Menlo Ventures, AMTrust, FF Venture Capital, Assurant and Nationwide Ventures. Sure is a platform that pairs individuals with the right insurance companies. They offer rent, condo and pet insurance as well as smartphone protection. You can access your insurance account both on the web as well as through their mobile app on iOS and Android. What makes this company unique is that it’s more of a “robo-broker” than an underwriter. They outsource their underwriting to firms like Nationwide and Chubb instead of handling the paperwork in-house. Using the app is very simple, which makes it highly appealing to their primarily millennial customer base. You can sign up for insurance whenever you want rather than waiting for a certain open enrollment period like other insurance firms’ mandates. You can also set your coverage period, so if you only need insurance for a few months, Sure will find you the right options. Additionally, you can get the perfect policy simply by answering a few questions. This AI broker has gained popularity by bringing a little transparency back into the business. What you see on the app screen is what you get. Additionally, there are no obnoxious hold times or long searches. People can sign up for a variety of insurance options hassle-free, and they’re even able to compare a variety of options to find what they want. With the latest round of funding, Sure wants to expand its current smartphone protection offerings. They’re introducing something that’s advertised as a “first-of-its-kind smartphone protection” product. This service will allow consumers to purchase smartphone protection at any time of the device’s lifespan, not just during the first few months of ownership like typical insurance plans offer. There will be limitations based on the smartphone’s conditions. Insurance companies don’t want to offer full coverage on a four-year-old smartphone with a bad battery, for example. So, they use artificial intelligence analysis and algorithms to test things like battery, CPU, and memory on a certain smartphone. Then, it will provide an adequate protection plan for the device at hand. The exciting thing about this technology is that it needs very little human interaction to work. The app’s patent-pending technology can find out everything it needs to know with a handy scanning software. Sure founder and CEO Wayne Slavin is positive that this technology, along with other innovations the company is pushing for, will lead to a brighter future for the insurance industry. Slavin claims that their processes and technology are superior to other startups like it. Most startups that could compare with Sure, such as Lemonade, Trov and Hippo, have begun to write their own policies. However, Sure is sticking with the brokerage aspect of their business plan, and they continue to grab big-ticket insurance names to add to their repertoire. This has helped them grow more quickly and expand their business internationally rather than being stuck in one part of the nation. This round of funding is closed, but we’ll likely see more in the future. Sure has made big waves in the insurance industry during its short life on the market, and as their innovation grows, so will the support for its products.